The book launch of The Milosevic Trial: An Autopsy by Timothy Williams Waters. Organized by the Department of Legal Studies and OSA Archivum. Welcome address by John Shattuck, President and Rector, Central European University. Remarks by Richard Goldstone (former judge, South Africa) and Tibor Várady (university professor, CEU Department of Legal Studies); response by Timothy Waters (editor). This is the first cross-disciplinary examination of the longest, most controversial war crimes trial of the modern era, and its contested legacy for the growing fields of international criminal law and post-conflict justice. The time of such an examination is fitting, with the imminent closing of the Yugoslav war crimes tribunal and rising debates over its legacy – as well as the 20th anniversary of the outbreak of the Yugoslav conflict. 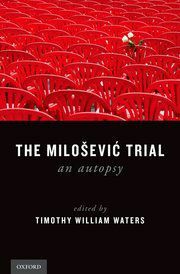 The Milosevic Trial: An Autopsy brings thought-provoking insight into the impact of war crimes trials on post-conflict justice. Timothy William Waters is Professor of Law at Indiana University Maurer School of Law, where he teaches international and comparative law. He earned a BA from UCLA, a Masters in international affairs from Columbia, and a JD from Harvard. Professor Waters previously worked at the ICTY, where he helped draft the Kosovo indictment of Milosevic. He has also worked with the Open Society Institute, Human Rights Watch, and the Organization for Security and Cooperation in Europe on issues relating to the former Yugoslavia. He regularly contributes commentary to major print and online media, including the New York Times and Foreign Policy, and is a member of the advisory board of Nationalities Papers. Visitors will have the opportunity to watch a 15-minute video compilation on the rise and fall of Slobodan Milosevic based on footage from OSA's audiovisual holdings, entitled Milosevic in the Archives.